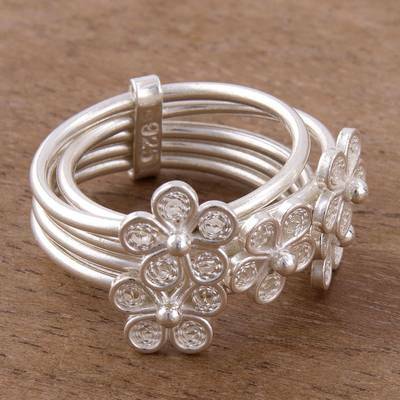 Floral Sterling Silver Filigree Cocktail Ring from Peru, "Orbiting Flowers"
Five lovely flowers orbit the finger, handcrafted with intricate sterling silver filigree work. Designed by Peruvian artisan Nancy Quispe, this cocktail ring features five individual bands that are connected together. You can find sterling silver filigree cocktail ring 'Orbiting Flowers' by Nancy Quispe in jewelry categories such as Floral Rings, No Stone Rings, Silver Rings, Sterling Silver Rings, Filigree Rings and Cocktail Rings. Enjoy exploring these sections for other Novica treasures. Nancy took many courses to learn the art of jewelry but fell in love with filigree. The delicate curvilinear lines of this unique style of silverwork are part of the cultural heritage of Northern Peru. Filigree jewelry is worn with many traditional costumes and a Marinera may not be danced without wearing filigree earrings. Nancy teaches filigree to her employees and others who seek her out asking to learn this art. Working with Novica brings Nancy a confidence that she previously struggled to find. Her Novica sales are steady and she has been able to find not only the belief that she will succeed but the steady income that she needs to survive. Nancy pays for her daughter's education. Her assistants also have children and are able to educate them with the income from their jobs. Nancy Quispe has received 5 microcredit loans with 0% interest from Kiva and Novica, the first for $200 and the most recent for $1000. Nancy now employs a man and a woman to help her. They each have children and are able to support them with their workshop earnings. Nancy won third place for innovation in filigree work at the national competition Patronato de Plata del Peru. Nancy and her husband support their seven year old daughter. This ring looks exactly like the picture. The details are simply gorgeous! "Peru's silver filigree jewelry is a part of my history, my culture, and my life. My designs reflect the natural world and the traditions of my country." "I'm Nancy Noemi Quispe and I was born in Peru's Paucará district in 1987. I consider myself to be happy, responsible and dedicated. I grew up in an environment surrounded by nature and it was a beautiful place with very diverse flora and fauna. Thanks to this, most of my jewelry designs are inspired by nature. "When I was young, I would help my mother take of my siblings. We would often play in the fields and sometimes find beehives and eat honey. "One of the things that impacted me was when my parents separated when I was young, but I managed to overcome it and this experience made me stronger and more secure in facing obstacles. "After graduating from high school, I enrolled in university to study special education, but I had to drop out due to family reasons. As a young girl, I was interested in creative and artistic works. An uncle encouraged me to study jewelry-making and I discovered I loved it! I signed up for a jewelry workshop, then another and another. In each one, I learned new techniques and how to create the different alloys with Andean silver — 950, 925 sterling, and others. "All my new knowledge came together as I began creating my own designs, and I discovered that this is my real passion. "Starting out on my own was complicated at first, because I didn't have the necessary tools. But with perseverance, I was able to buy the essential implements and materials to launch my own workshop. "Today, I work with my husband and brother-in-law and we all have different tasks. My husband and brother-in-law help with the administrative work and assemble the jewelry. I am in charge of designing, weaving the filigree strands and quality control. I use silver, semi-precious stones, wood and leather. Like any other job, it's difficult starting out but, after becoming more skilled over time, I found that working with silver isn't that hard. "I love looking at a completed piece of filigree jewelry. Seeing the beautiful and incredible results of my work motivates me to create even more designs. Peru's silver filigree jewelry is a part of my history, my culture, and my life. My designs reflect the natural world and the traditions of my country. "Thanks to jewelry, I met my husband, the love of my life. He's very dedicated to this art and is very supportive of my work. We also have a beautiful daughter who makes me so happy and motivates me to get ahead. "One of my future plans is to have a school to teach and train young people who are interested in crafting jewelry. I'm very grateful to Novica and happy to be a part of this group that is showing my art and designs to the world."